Although there is of course Exit Through The Gift Shop and Banksy has participated in short films about his work (and it’s fair to assume that this one had his blessing), this is the first time I can think of where Banksy has really posted any video art in the same vein as his street art. Someone please correct me if I’m mistaken about that. Greg at Melrose&Fairfax wonders, “Sure, [sic] its entertaining, but how does this online video fit into the theme for this show, Better Out Than In?” But what Greg seems to be missing is that the internet is a public space now. So much street art and art in general is made to be seen online be the same public that’s supposed to be seeing street art on the street. Besides, this video is still “out” in the sense that it has been published online, to be seen for free by anyone with the capabilities to visit YouTube, rather than made for a gallery where an art dealer might screen the piece and then sell it to private collectors in DVD format as an edition of 10. This video may not be on a wall, but it’s definitely more out than in. In that same post on M&F Greg also asked, “Why not do some street projecting of the video onto a wall in New York to keep it outdoors?” But nearly half a million people have seen this video less than 24 hours after it was first published. Why do a street projection for a few hundred people? The only advantages I can see to that over posting the video to YouTube are are the randomness of the physical crowd and the shock of a video projection suddenly starting up (and on a silly technical level, keeps the show “on the streets of New York”). Valuable advantages, but YouTube still seems a better route and not out of line with the theme of the show. Another cool thing about this video is that we actually get to see stats. 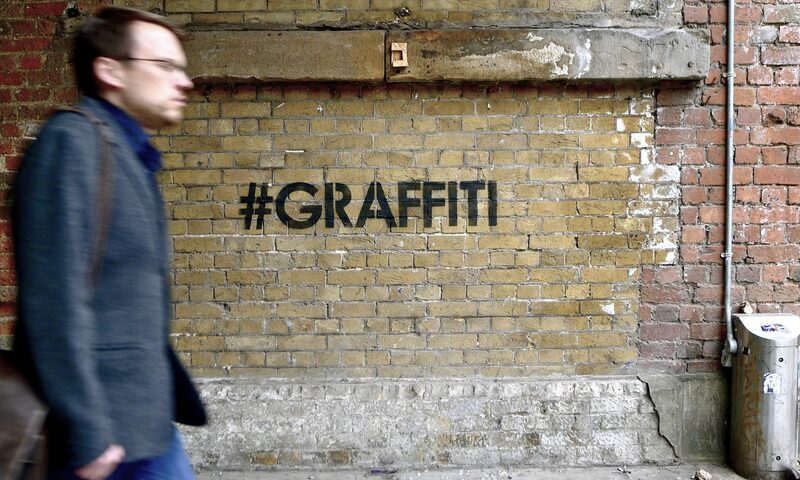 Normally it’s impossible to say how many people have seen a given work by Banksy. The answer with this one: A lot. But I guess that’s no surprise. There are at least two questions that the production of this video raises: 1. Was it legal to use Dumbo in the video, and if not, what might happen here? 2. 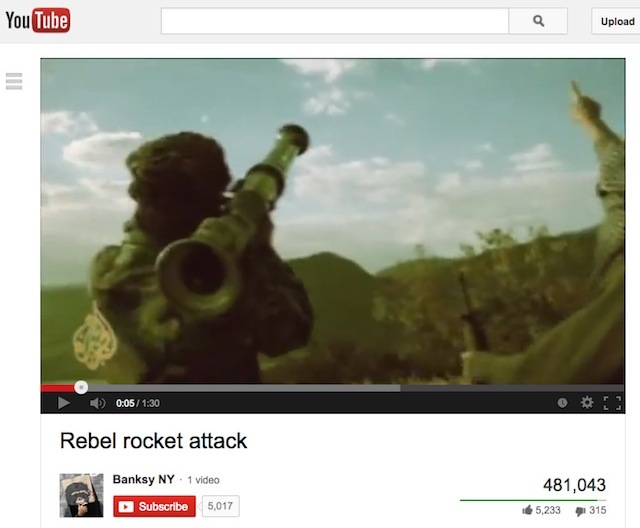 What does it mean that Banksy used audio footage from what appears to be a real video of a rebel in Syria shooting down a helicopter with a rocket in his video (thanks to Felim McMahon on YouTube for catching that)? As for Dumbo, I’m no lawyer but American courts have generally determined that fair use exists in cases of parody, but not satire. Since in Rebel rocket attack Banksy uses Dumbo as in a larger satire and not to parody the character of Dumbo, it seems unlikely that a fair use defense would fly in (an American) court. So, if Disney cares about this and Banksy didn’t license the use of Dumbo in this video, there could be theoretically be legal issues here, though I doubt it will come to that. Just something to keep in mind, though I only bring it up because I’m a nerd about our messed-up copyright system. The second question is particularly tricky. Today, half a million-ish people chuckled while listening to audio of a someone being killed. And hopefully, after they laughed, they paused a moment to think about the stupidity of war. I’m not sure what it means, but surely it means something that Banksy appropriated some of that audio from somewhere other than a Hollywood movie. My initial reaction to discovering the audio source was “Wow, that’s terrible that Banksy used that audio,” but I don’t think it’s so simple. The audio was already out there, as was the original video, so why shouldn’t he use audio that already exists? Banksy didn’t tell anyone to shoot down a helicopter? Still, perhaps it’s disrespectful to the dead, even if they were soldiers in a brutal regime. Before today, I sure hadn’t seen that original video, but now I have. Banksy’s video has more than 10x the views of the video that he got the audio from. Maybe this knowledge makes the video more meaningful. Like I said, I’m still processing this information. It’s something to think about, and I would love to read your thoughts in the comments. PS, there’s no Banksy + 5 today because I felt like I would have covered this piece on Vandalog even if I weren’t doing the Banksy + 5 series, plus it’s a video so that slightly complicates the Banksy + 5 theme.